I thought I had it all figured out after last Saturday’s final Long training run – my planned marathon outfit had been flight tested, my wireless headphones checked out, and my running playlist updated. We headed into full taper mode, keeping a watchful eye on the upcoming weather for Saturday’s race. Earlier in the week, the forecast called for 20% chance of rain with temperatures cooler than normal at 40-60 degF. No problem, actually very nice weather for running. But as the week progressed, we watched that chance-of-rain percentage grow to 80%, with the most probable rain falling during race time. While I don’t mind running in the rain, I’ve never run more than 60 minutes in a light rain and that was in the summer with no wind. Another factor – while the temperatures will hover between 45-50 degF (not too bad), there will be a 15 mph wind from the east, so for the last 6 miles, we will be running straight into the wind (not good). Instead of a short sleeved UA tech top, I will run in a long sleeved merino wool shirt from PEP. I’m choosing this shirt because the wool will keep me warm with the cold rain and wind. If I get too hot, the sleeves are loose enough for me to push up. I’m also putting a fresh shirt out on the course, just in case I need it (one of my friend’s house is at mile 16). I originally planned to wear a cute running skirt, but that no longer works because of the wired headphones. My phone, with the Lifeproof headphone adapter no longer fits in the pocket of the skirt. Instead, I’m going with the running shorts I wore for the Chicago Marathon. FlipBelt. I’ve run with this all winter long, and hadn’t planned on using it on Saturday, but it will now hold my iPhone. I will attach my race bib to the Flip Belt, too, instead of pinning it to my shirt. This will make any needed shirt adjustments easier (like getting a fresh shirt half way through the race). [Sorry if this is TMI] I'll use Aquaphor and Body Glide on my feet. I expect they will get wet and I’ve read these products may help minimize blistering. I also used waterproofing spray on my shoes. I will don a trash bag / disposable rain poncho to keep me dry-ish and warm(er) while waiting for the race to start. Just so you know, I've opted for the sleek trash bag look with the tall, white kitchen bag variety because deep down, I want my race photos to look fabulous. I normally run with a white brimmed hat in the summer as it keeps my head cool (black hair is notorious for soaking in the sun's heat), and in rain it is a must. I convinced two co-workers to go out and buy wicking running hats this week for the race. I do know this - even though I cannot control the weather on race day and I cannot control the course conditions, I can control the way I talk to myself during the event - I will stay positive, I know I can get the race done. 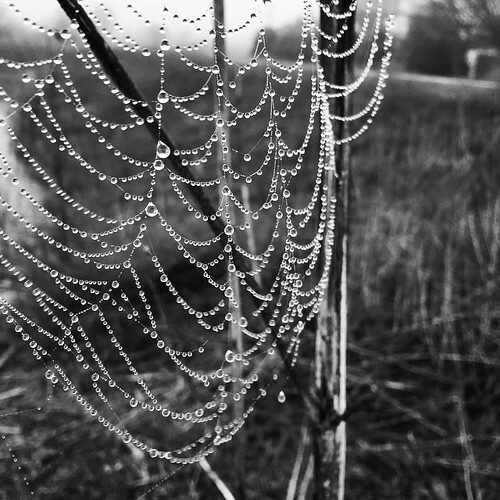 Finally, since I can't have a blog post without some sort of photo, here is one I took last week, during a foggy morning run. Good luck to all my friends - fellow marathon training buddies running in the Illinois Marathon events! My husband will be running his first half marathon and several co-workers are running the full marathon. It's going to be great! I will be thinking about you! Sounds like you are prepared for just about anything. Good luck and most of all ... Enjoy yourself and have fun. You're going to do great. I've been wondering what you're planning on wearing! Sounds like a good plan. Do you have any hats you recommend? I wear them a lot in summer and only have a few (one Nike dry fit and some Lulu). I ordered the Hit Your Stride skirt and really love it! Thanks for the suggestion! Good luck to you, your husband, and your friends this weekend! I'm sure whatever the weather, you'll do great.